Photo Credit: Lynda Gray, Ts’msyen author of First Nations 101. 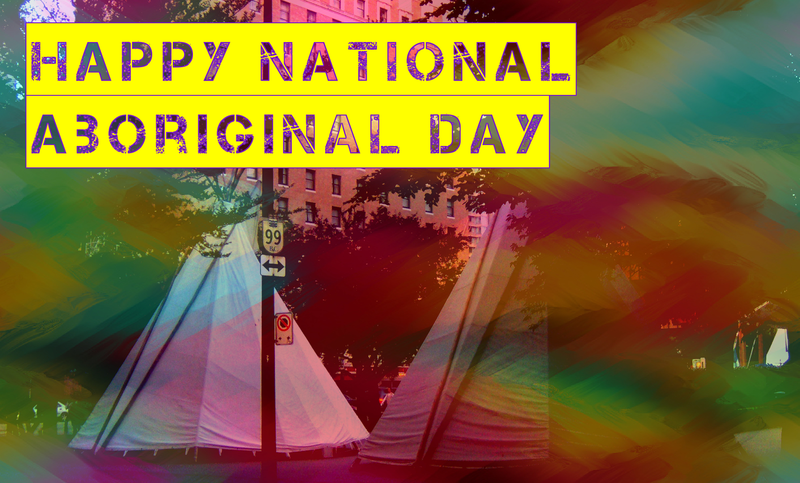 This June 21st, 2016 is significant as it marks 20 years since National Aboriginal Day was instituted as a national holiday in Canada. This is the one day specifically for Aboriginal people (and non-Aboriginal) across Canada to come together and celebrate, share meals, stories, music, and partake in cultural activities ranging from salmon feasts, canoeing to listening to throat singing. Aside from being National Aboriginal Day, June 21st is also the summer solstice. It’s the longest day of the year and the shortest night of the year. This year we were fortunate enough to see the Strawberry Moon where the moon shone bright pink. It’s naturally a day to spend time in the warmth of the sunshine and celebrate the earth’s rotation in bringing us a renewed wealth of life. People from all walks of life on June 21st come together to recognize our diverse cultures. In cities it can often feel stifling or invisible to be an Aboriginal person with distinct legal traditions, culture, history, and a distinct past. One that includes a lot of cultural and legal strengths, but that is often fraught with continued difficulties. This last year the Truth and Reconciliation Commission formally closed in Ottawa with the release of their Final Report and Calls to Action. The closing of the TRC ended their 5-year mandate as part of the “truth telling and reconciliation process” in response to the Indian Residential School legacy. At the TRC closing there was a lot of good energy shared between people. There was a walk for reconciliation, workshops, musical performances, art exhibits, and informal drumming and dancing that happened in the streets and hotel foyers. That energy will never be forgotten and neither will the residential schools’ dark legacy. This day is part of recognizing the truth-telling that happened through the TRC. On my way home, I had a conversation with my mom about the good energy that I felt from attending the closing ceremonies. I left Ottawa with a renewed sense of who I am as an Aboriginal person living in a big city. I had time to reflect and find strength from being with survivors and allies. Attending the TRC was truly an internal and external reconciliation with Canada’s residential school legacy. On June 22nd, there will another opportunity to build relationships, reconcile, and celebrate who we are as Aboriginal people in Canada. Over 300 school children, Aboriginal people, and community members will be doing just that at the Walk for Reconciliation at Saskatoon’s Victoria Park at 10am. This walk is to commemorate the one year that has passed since the TRC’s closing and for people to “rock your roots”. Let’s continue that good energy that was felt at the TRC’s closing and be proud of our distinct heritage, be it Mayan from Oaxaca, Dene, or Cree! About the Author: Christina Gray is legally trained and works in Publications at the University of Saskatchewan’s College of Law, Native Law Centre of Canada. A first people of the Ts’msyen of Lax Kw’alaams, Dene from Lutsel K’e, and Red River Metis.